***Disclosure: I appreciate you visiting my site and I wanted you to know that there are affiliate links included in this post that may generate a small amount of money. If any money is earned, it will not only go to the "Ruggieri fund" but a percentage of it will go toward the Food Bank of South Jersey. With the end of the summer drawing to a close I am desperate to get in as much fresh produce as possible. After all, I am from the Garden State where the best thing we have going is the fresh tomatoes! And they are darn good! My attempts at making small garden salads were boring my husband so I decided to turn it up a notch and make something a little more hearty like SaladWorks does while including as many yummy veggies as possible. This Buffalo Chicken Salad was inspired by Six Sister's Stuff but tweaked a bit to fit our tastes. 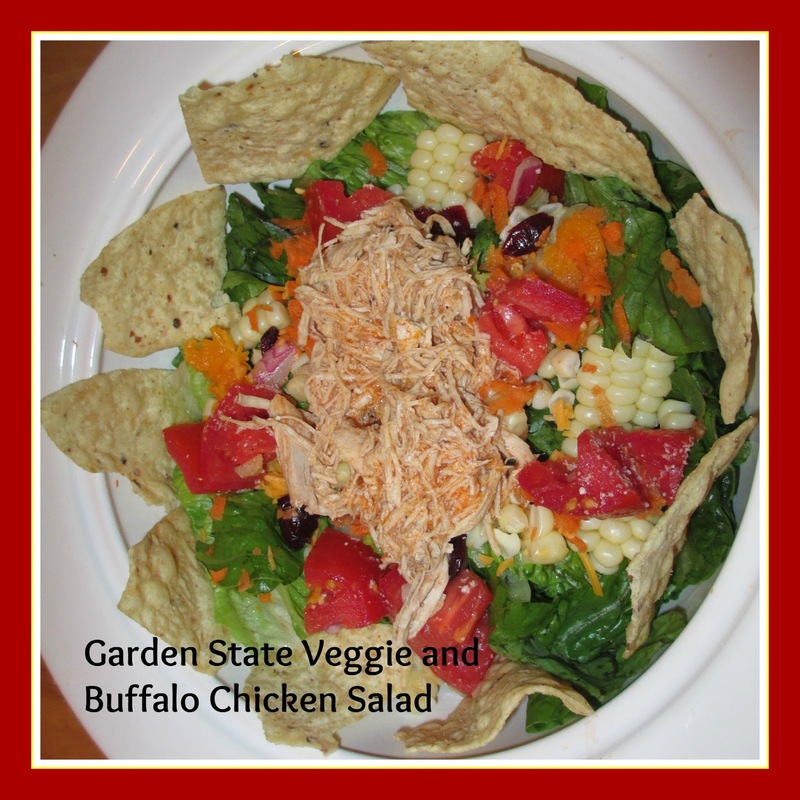 Check out their yummy version Skinny Slow Cooker Buffalo Chicken Salad.They also have a cool book,Six Sister's Six Sisters' Stuff: Family Recipes, Fun Crafts, and So Much More, with tons of recipes including a slow cooker section. Awesome! I used the crock pot just like Six Sister's did for two reasons: the chicken is more tender and it pretty much cooks itself! Place the chicken in the crock pot and cover it with the chicken broth. Cover and cook on high for 3 1/2 hours or low for 7 1/2 hours. Add Buffalo Sauce, stir and let it cook for another half-an-hour. (chicken should cook for a total of 4 hours on low or 8 hours on high). Remove and shred. Clean the corn on the cob and cook in boiling water for about 3 minutes. Using a knife remove the kernels of corn. Wash and dry your lettuce (salad spinners are helpful!) Break the lettuce into bite sized pieces. Add tomatoes, craisins, cucumber, carrots, cheddar cheese, and sunflower seeds. Top with shredded Buffalo chicken and garnish with tortilla chips. Serve with Bleu Cheese dressing. Looks delish!! I love to enjoy a hearty salad for dinner. Yum, that looks great!! One of those perfect dinners for a warm night. Pinning this one to try in the next few months! Yummy! This looks like a terrific meal, pinned it to my favorite foods board! That salad looks so good. I guess it is lunch time for me.